Seeing people succeed is amazing. Especially when its people you’ve known and grown up around. Chris Texiera aka “Tex” had all the makings of hardwork, dedication and customer service from the get go. He was always one of the nicest dudes to be around, party with and just to have as a friend in general. Ill never forget when Chris was working at Formaggios and he saw me come in with my father knowing how much I love pork belly. He whipped an appetizer on the house for us with his classic light up the room smile and handed it over. Generosity defines him. I am not surprised in the least that he has been tapped to move up to the next level in the highly coveted position of executive chef. That title alone is not without painstaking years of hardwork, washing dishes, prepping, learning the ropes from the ground up and shedding blood, sweat and tears. To be chosen at NOBU is just amazing. His job will not come without long hours and stressful nights but his skill, determination and experience over the years has obviously prepared him for this new challenge. Maybe a restaurant of his own will happen in the future. Hes got it, from nuts to bolts. Congratulations Chris! You deserve it. Ive been saying this for years, but I need to get over there and see ya. Personally, i never thought Id see the day but over 80+ catamarans and canoes just got notices on Aloha Friday of all days that they must remove their vessels from state lands or face their boats being taken and impounded. So let me ask you guys something. Significant beach area for whom? We all know the state does not truly care about the residents because they aren’t enforcing existing laws with zoning on illegal rentals and commercial activity, yet they want to remove one of our longest standing locations, and in my opinion a beautiful Hawaiiana scenic beach vibe of canoes and catamarans for “more space”. That space is for tourists. Lets be honest. Mufi Hannemann just made this video which seems more like desperate plea and a bid to “get more state money” for tourism. Thats the agenda. Straight up. So heads up my boating friends. They are coming for you and going to start a sweep in coming weeks. What a shame. These statements above reflect my personal opinion on the situation. Please return back to My Kailua’s post to share your thoughts. I remember as if it were just yesterday, hearing the news of my cousin killed in action on August 6, 2011, while conducting combat operations in Afghanistan. Formerly from Kailua, Senior Chief EOD Technician Kraig M.K. Vickers, a local boy from Hawai’i served his home and country in one of the most dangerous places in the world since Vietnam. The family later moved to upcountry Maui where he spent most of his life. Kraig was your typical rascal, funny, sports playing, and well-liked boy. He was very loved, respected, and a decorated soldier who loved his family, island home, and country. It was an overwhelming tribute as we didn’t realize how selfless and admired Kraig was. A few of his buddies shared at the funeral of the secretive missions they conducted not knowing if they would make it out alive. But somehow Kraig made sure that everyone else did even if he wasn’t sure he would. We laughed as they told stories of the typical Kraig we knew him to be – the thrill-seeking, kept you guessing [guy] but also the one who made you feel safe and included. They honored him well that day – not a dry eye whether from crying or laughing nor an empty seat in the MAC Center, standing room only in and outside. After the ceremony, a convoy of what seemed like all of Maui drove through Kahului and Pa’ia town on the road to Hana to continue his tribute which included a complete military ceremony, and a flyover with the assistance of US Navy. Since 1868 we’ve been honoring our fallen soldiers and those serving in all branches of the military with a national holiday. Originating after the Civil war and known as Decoration Day, Congress later declared it a national holiday in 1971 and renamed it Memorial Day. Commander in Chief John A Logan established a day to lay flowers or decorate the graves [hence Decoration Day] of fallen soldiers who died defending their country during the Civil War. A woman’s association in Mississippi decorated the graves of fallen soldiers from both the Confederate and Union as Logan described the horrific moment with bodies lying in every city, village, and churchyard. It was a moment in history that was most defining for our country and all Americans. When the federal law changed the observance of the holiday to the last Monday in May, it also extended it to honor all those who died in American wars. The first national celebration took place on May 30, 1868, at Arlington National Cemetery. It still takes place there with a wreath placed at the Tomb of the Unknown Soldier and small American flags decorating each grave. Hawai’i adds our own special mahalo with Hawaiian lei for our local fallen soldiers. There are many ways we’ve come to honor our fallen soldiers from the Mayor’s morning service at Punchbowl Cemetery or later at the Governor’s ceremony in Kaneohe at the Hawai’i State Veterans Cemetery. Or with bbq picnics amongst family and friends, unique social media posts, texts or phone calls to families who’ve lost a soldier, or a thank you to those who are still here with us. However you choose to celebrate it, I know one thing is sure, your heart is full of gratitude for the sacrifice they made. Kraig’s family started an honor run/walk to promote awareness for the Military service members from our community who have served and continue to serve for our freedoms. Held in August on Maui, this year will mark the seventh year for the run as well as Kraig meeting his Lord and Savior in heaven. Another Kailua resident and fifteen-year veteran, Lieutenant Duane T. Zitta of the 14th Coast Guard District in Hawai’i chose to honor his fellow servicemen by participating in the Coast Guard Foundation’s Run to Remember. Lieutenant Zitta is an avid runner, health enthusiast, and decorated serviceman with assignments taking him all around the world protecting and defending our freedom. Started in 2011, to honor fallen Coast Guardsmen the 100-mile Run to Remember provided a time to reflect but also brought awareness to fallen Coast Guardsmen and their families. Thousands of participants around the world partake in road races, memorial walks, and other types of fitness events to raise money for the Fallen Heroes Fund. While writing this story, I’ve noticed similarities between the two men and one that continues to strike me over and over is how selfless they are. It is true that they signed up for this, and it comes with a price, but both Kraig and Duane have gone beyond with honoring their fellow servicemen and women in all they do. With Memorial Day approaching, we honor and celebrate ALL servicemen, and women [and families] – past, present, and future for their ultimate sacrifice. My family alone has seen its share of servicemen and women from the Army to Navy, Marines, Coast Guard, and National Guard with tours to Afghanistan, Vietnam, and World War II. I hope you take time to hug a friend or family member a little tighter and feel blessed knowing you have another day to enjoy. But most importantly, say a prayer for the families and thank a hero (whatever time of the year) as I’m sure all of you know someone who has served or continues to serve and protect our freedoms. I know I will! If you would like to honor our fallen soldiers, string a lei or donate flowers to the Mayor’s office as the Boy Scouts decorate the many graves for Memorial Day. Or stop by one of the services honoring our soldiers. Or, plan on joining the Vickers ‘ohana on August 5th for the seventh Honor Run for Kraig M.K. Vickers. Check out Kraig Vickers Honor Run on FB for information and race updates. Without any notice, the Olomana Golf Course shut down this week. No staff, no lights on and no sign of whether the golf course would ever come back… until randomly at the very last moment there was a glimmer of hope with a press release stating they would be open immediately. Signs of trouble began to show when the bills weren’t being paid on time. Eventually those bills fell into default with over $110,000 being owed to the state. Shortly after, the golf carts which were on lease, were reposessed by the company renting to Olomana and the owner of those carts said it was the first time they have ever experienced anything like this. The state is now wanting to take back possession of the land it leased out to the Golf Course with papers filed this yesterday by the Department of Land and Natural Resources ending their agreement. This should be interesting being that they have announced a re-opening. As of right now, it appears they will completely lose their lease which was set as a 65 year lease that ends in May of 2032. What happens to those lands could be anyones guess if the state takes over. New ownership? or something entirely different. With 4 Golf Course options on the windward side, this one could be dead in the water unless by some miracle, they have figured it out clutch, in the knick of time. In a twist of fate, Kailua’s beloved malasada maker Non Demello, has been acquired as the lead baker for health food chain Down To Earth. The sudden closing of Agnes’ Bakery left the town in a carb vacuum wondering where they would get their next sugar treat. For over 50 years, Agnes’ served the Kailua company and 30 of those years Don was at the helm of the ship. Since that operation closed doors, another health food location entered in its wake. “Non is working with our food service director, Edgar Edge, on revamping and developing new recipes for all of our made-in-house baked goods from breads and muffins to new pizza crusts,” Cynthia Cruz, Down to Earth’s marketing manager told Pacific Business News on Friday. If you have ever been to one of Kailua’s Farmers Markets you have most certainly seen fresh Nalo Greens. 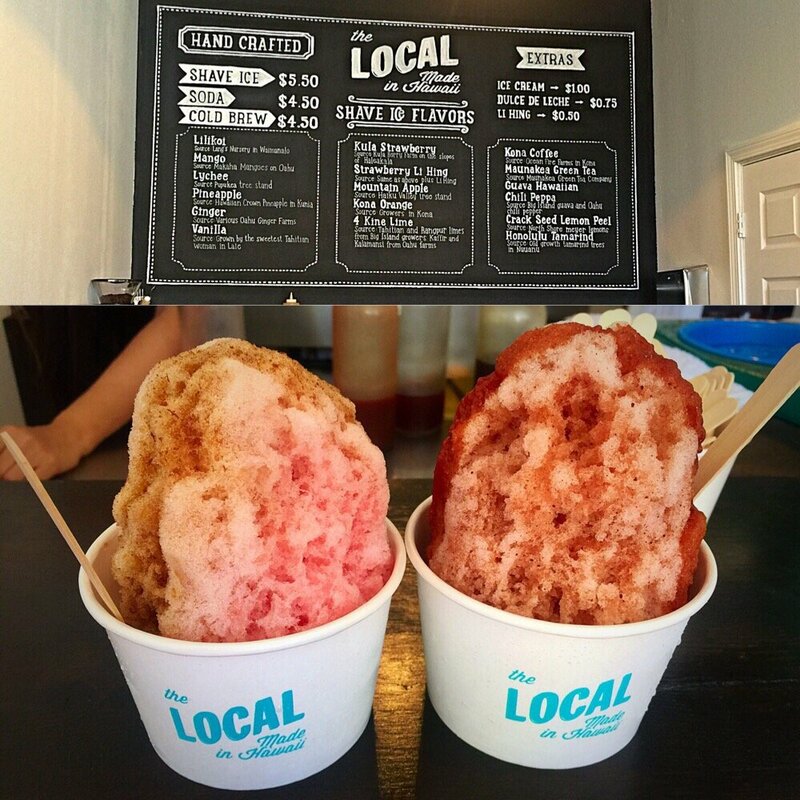 A locally owned business that has become a staple in the Hawaiian Islands at grocery stores and restaurants alike. In fact, Nalo Greens is often preferred over your standard house greens. Last week, our islands were delt a massive blow by an unsuspecting storm which left homes in ruins, cars under water and sadly its destructive path touched Nalo Farms as well. The damage done was described to be over 100K in losses. Ovr 12 out of the 14 acres were decimated with serious damage to irrigation, fencing and of course, their crops. Amongst the damaged produce were roughly 50 beehives that were dragged over 300 yards down hill by the rushing and what seemed never ending flood. A GoFundMe campaign was recently sent to us as they look to raise $100,000 to help get the farm back in working order to repair, replant and serve the community as they have for years. As of writing this , they have reached almost half of their requested amount! Please feel free to SHARE this post and help Nalo Farms get back on the kitchen table. Tucked away on 1100 acres of lush and enchanting landscapes in the center of the Royal Hawaiian Golf Club in Maunawili, Kailua sits The ‘Olena Restaurant. Don’t let the name fool you, it’s not a club and you do NOT need to be a member to eat there or even golf there. The restaurant was given the name The ‘Olena due to the fact that ‘Olena plants lined the walk way up to the restaurant from the Pro Shop area. The concept of the restaurant is to promote “farm to table” whenever possible. Most of the produce comes from local farmers or sourced by local distributors. Their Makaweli Burger comes from beef from the Makaweli Ranch on the island of Kauai. The restaurant also prides itself on putting a twist on popular comfort foods. The ‘Olena’s Loco Moco is made with a demi glace instead of gravy. On their signature french toast, they use their own maple-bacon cream instead of standard syrup. Even their signature Caesar salad is non-traditional, where they use Szechuan peppers to change the spice profile and is given a distinctive taste. General Manager Darin Sumimoto has worked at that facility for over 25 years and has outlasted a few owners. Darin grew up in the valley, played in the streams and picked mountain apples from the seemingly untouched natural treasures beyond the well kept greens. It is fitting that he works on the land that he grew up on and has an extreme passion and love for. Darin was also able to show me some cultural Hawaiian treasures that exist on the 1000+ acres of land that included a bathing area of Queen Liliuokalani. Food & Beverage director Shaun Myers and his family have Kailua roots as well and still remembers all the parades he use to get to see as kids from their family home on Kainalu. The Local Hawaii is the collaborative effort of local creatives, Gabriel (Gbo) Tennberg and Kahana Kalama. Originally from koloa – Kauai, gbo moved up to California where he assumed the position of Creative Director for several top tier action sports brands. During that time he also founded Mucho Aloha, and has since moved back to Kailua with his wife and 4 kids to spearhead the Local. Hailing from a lineage of Hawaiian watermen, Kahana Kalama was born and raised on the east side of Oahu. Kahana ventured to San Diego 10 years ago to pursue a degree in Business and has been splitting his time on both sides of the pacific ever since. After a decade of toiling in the surf/fashion trade as both a professional surfer and hired hand for different brands in the industry, Kahana realized it was time to embark on his own journey. In 2011 Kahana Kalama co-founded Aloha beach club and opened the flagship retail store in North Park, San Diego and their second location in Kailua. Both Gbo and Kahana were at a point in their lives where they were looking to be able to spend more time on the Islands closer to family and their roots. 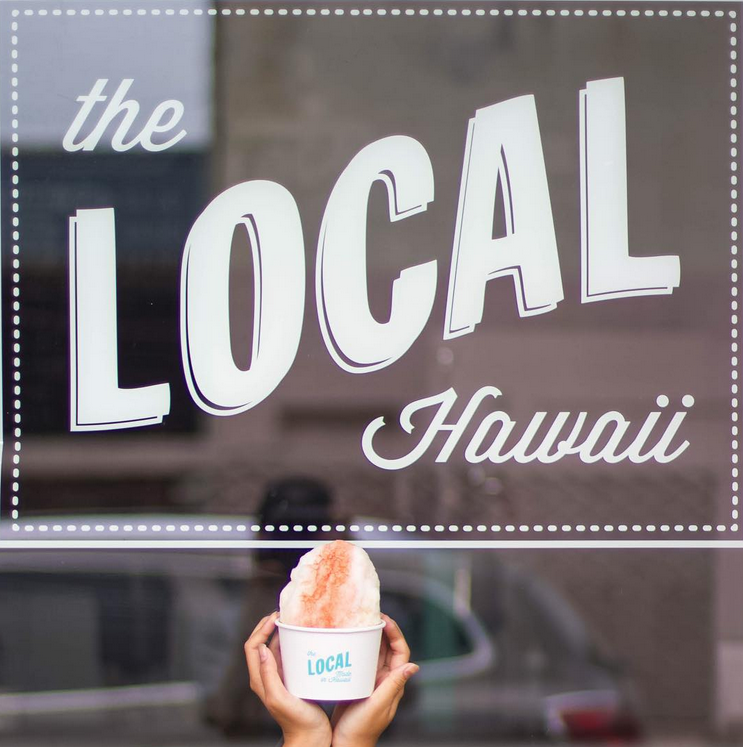 After connecting over a shared desire to create products that were made in Hawaii and a space that would bring people together, The Local Hawaii was born. 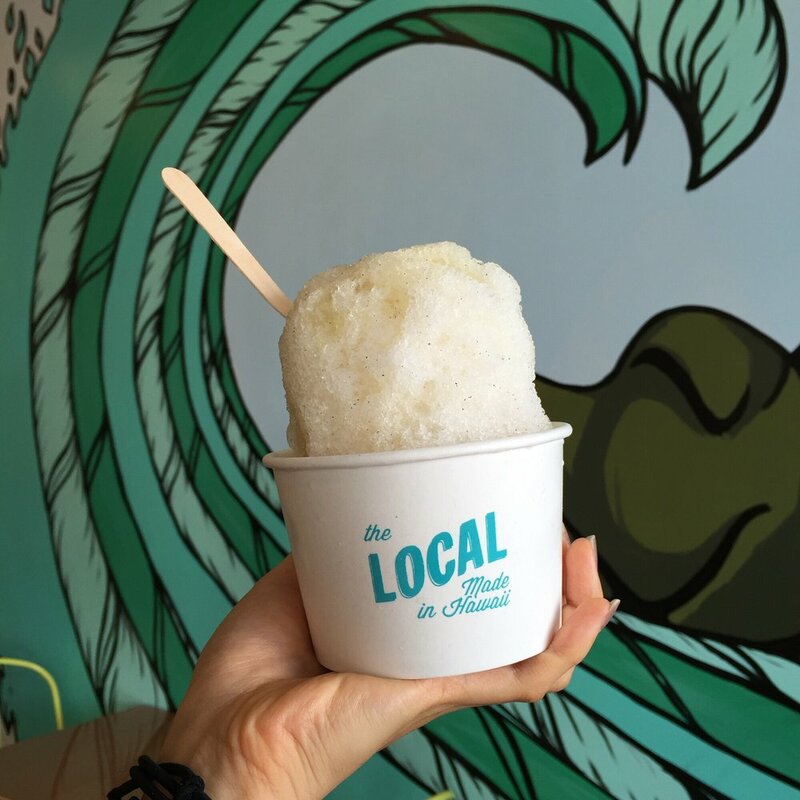 On February 7, 2015 The Local Hawaii opened their doors offering all natural shave ice, craft sodas and pour over coffee made from locally grown produce. 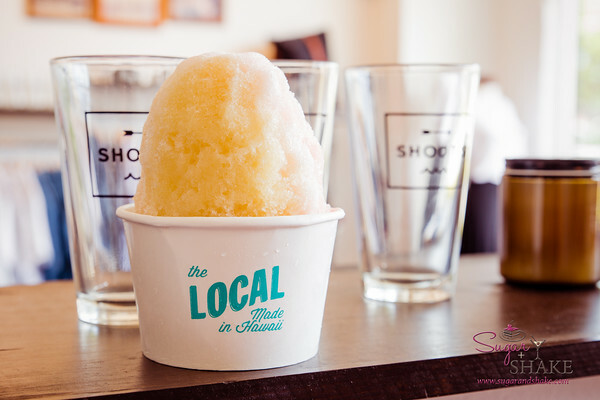 Local Tip: In my opinion, this is THE BEST shave ice in town.